For the past four years, a small team of dedicated medical professionals has held together a skeletal network of bombed out and underground hospitals across opposition-held Aleppo, providing life-saving treatment to the civilians caught in Syria’s deadly war. From the Turkish side of the border, the imposing red metal frame at the Oncupinar/Bab al-Salama crossing in Kilis firmly sealed Syria from our sight. On clear days, aircraft could be spotted circling above and the sound of bombardment resonated nearby, leaving us to imagine the fates of those trapped on the other side. Occasionally, an ambulance would slice through the gates, past the waiting journalists and down the road to the nearest state hospital. With passage denied to all Syrians except for emergency medical cases, the Red Crescent ambulances became the only vehicles to emerge from northern Aleppo. They carried the Syrian doctors allowed to cross back and forth, carrying their stories with them. The doctors are natives of Aleppo, a city well acquainted with the destruction of its healthcare facilities and the extraordinary resolve of its medical workers. The Syrian government’s barrel bomb campaign, which began in December 2013, obliterated nearly two-thirds of the city’s hospitals, killing a large portion of the medical staff and forcing the majority of those who remained to flee. But the doctors and nurses who stayed behind rebuilt a skeletal version of Aleppo’s once-thriving healthcare system, setting up underground hospitals and founding their own regulatory bodies. The first of these, the Free Medical Association (FMA), was formed in the summer of 2012 by Dr. Mahmoud Mustafa after half of the northern city had come under control of the opposition. Suddenly, he said, there were a lot of half-destroyed hospitals that needed to be staffed and managed. A tall, pensive figure, Dr. Mahmoud was one of the silent forces behind the reconstruction of eastern Aleppo’s healthcare system. He studied medicine in Belarus before specializing in ophthalmology in Aleppo and now works in several hospitals across Aleppo province. 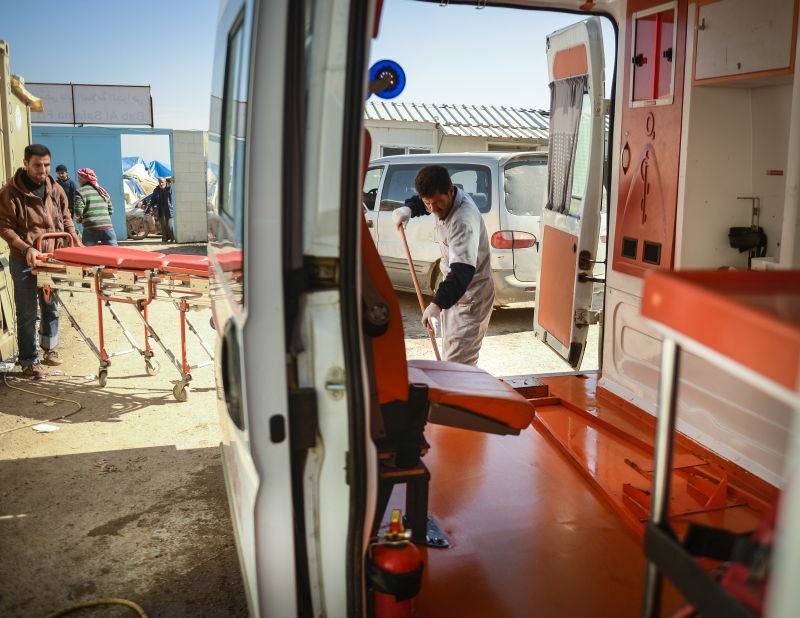 Like many others, he has worked himself to the bone to ensure Syria’s understaffed medical facilities could cope with the steady flow of incoming patients. One of the first FMA facilities was the seven-story Dar al-Shifa hospital, flattened in a November 2012 government airstrike after six previous unsuccessful attempts. Although a proud Aleppian and head of one of his city’s major medical boards, Dr. Mahmoud also had Turkish heritage and knew the long-term provision of medical services in Aleppo would benefit if he were to relocate his base across the border, 31 miles to the north. The shift would help anchor a critical supply line into the city. In 2014, he and a core team of Syrian doctors moved to the Turkish border town of Kilis as an NGO licensed under the Independent Doctors Association (IDA). Their biggest project was the creation of the Bab al-Salama Hospital, which is now steadily absorbing the area’s war wounded and evacuating the gravest cases to Turkey via a special referral system granted by the governor of Kilis. The team also runs a fleet of ambulances, and has a generator that supplies medical oxygen for patients across northern rural Aleppo. Inside Aleppo city itself, the team runs the city’s last pediatric hospital, including a new center for child malnutrition, a rising concern in the war-stricken eastern neighborhoods. In the early hours of February 2, we traveled down to the Turkish-Syrian border from Gaziantep on the road that leads to the city of Aleppo 62 miles away, unnerved by the reality that access would soon be severed on the other side. By all accounts, Aleppo was about to be encircled in one of the biggest changes of momentum in Syria’s war. “All I could think of was how to get my Plumpy’Nut to Aleppo. I was afraid another Madaya would happen,” said Dr. Salah Safadi, who supplies the bars used to treat severe malnutrition to Aleppo’s children’s hospital. 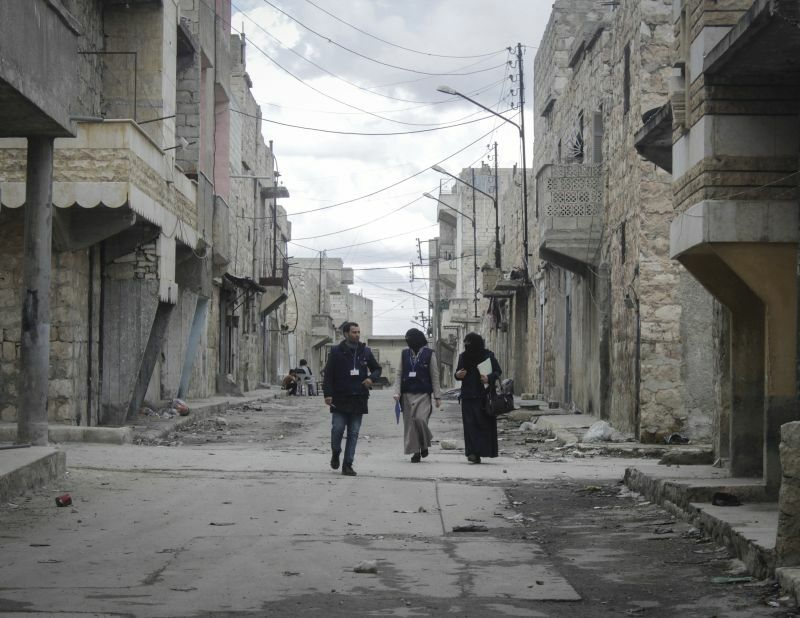 When the revolution broke out in Aleppo, Dr. Safadi was in his third year of a neurology residency, living and working in what became the regime-controlled side of town. “It was a struggle in my head. Should I go and join my people or complete my dream of being a neurologist?” he recalled. But as the bodies of protesters piled into his clinic, he made his choice. Medicine was easy to access in those days, so Dr. Safadi and his colleagues began sending the necessary items to opposition field hospitals in the north. “We felt we were doing something,” he recalled. He left for Gaziantep a year and a half later with the FMA, and became IDA’s health manager. Arriving at the border that morning, the scene awaiting the doctors forced their unique cross-border relationship into full operational mode. Some 45,000 newly displaced people had gathered at the Bab al-Salama gate in just 24 hours, in a mass migration not seen in Turkey since last year’s influx from Tel Abyad. 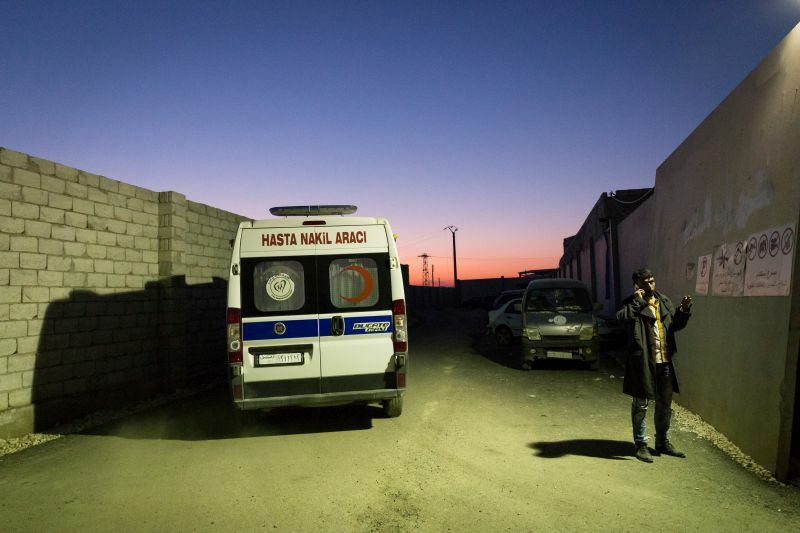 Entire villages were emptying, and Ankara was accusing Russia of ethnic cleansing. The already full IDP camps dotting Turkey’s border were overflowing. New camps were being built. The doctors responded by rushing in emergency mobile clinics, and graveling empty fields to make space for new tents. It was a difficult sight to witness, particularly for Syrian doctors who had long fought to keep Aleppo alive. 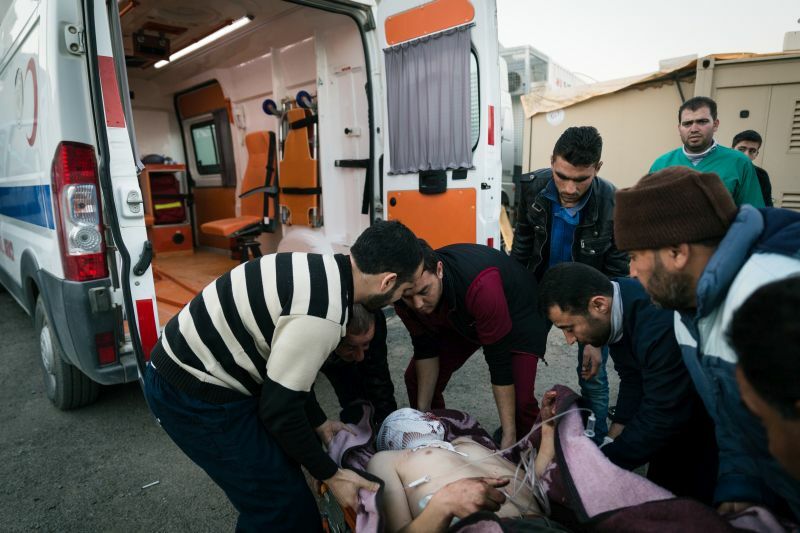 Medics in Syria know 2014 as the year of the barrel bomb, and 2015 as the dawning of the Russian air campaign–the worst period yet for attacks on hospitals. In 2015, Doctors Without Borders (MSF) documented 94 attacks on health facilities in opposition-held parts of Syria, making it the worst year for Syrian hospitals since violence began in 2011. At least 17 such attacks have taken place in 2016, pointing to what some have labeled a deliberate plan by the Syrian government to drive civilians out from areas outside its control. Superior Russian airpower has helped to accelerate the process. On February 2, IDA’s Maskan Hospital near Tel Rifat became the first to be targeted during the Russian-backed Aleppo offensive. The staff narrowly escaped, having evacuated earlier that same day. Under the cover of night, the head doctor crept back to photograph the 13-foot-deep crater left behind and retrieve as many supplies as possible before pro-government forces took over the town. A few days later, the team bitterly watched a government takeover and looting of the hospital on state television. The shutdown of northern Aleppo’s health facilities was immediately felt by Dr. Mahmoud’s Bab al-Salama hospital, the largest functioning hospital in the province. Ambulances came from across the region. Surgeons were performing twice as many complicated operations per shift as usual. “Every day I see women crying over their husbands, mothers over their children – but this was different,” said one surgeon. After a few days, a shaken Dr. Mahmoud emerged from Bab al-Salama to describe the scene. “We are increasingly seeing what we call multiple-trauma injuries because of the bombs and the heavy weapons they are using. There are large burn cases, lots of amputations and internal traumas,” he said. When Bab al-Salama reached full capacity, the doctors had to authorize an unprecedented transfer of 40 patients to Turkey in one day. The Turkish hospital in Kilis even temporarily suspended its outpatient services to send more staff to its emergency rooms. Scores of injured Syrians were amazed, rescued just hours before from the rubble, to find themselves in a country safe from airstrikes. The Bab al-Salama Hospital sits along the Turkish border, enclosed in a strip of land protected by NATO that runs about three miles into Syrian territory. A de facto no-fly zone, the narrow slice of land is considered the safest bet in a civilian area that otherwise has no cover from airstrikes and military operations carried out daily. As Kurdish forces descended on Azaz in mid-February, during the second phase of the Aleppo offensive, doctors quickly removed their supplies from their main depot in Azaz city back to Bab al-Salama, their faith in Turkey’s uncrossable “red line” already waning. Aleppo, meanwhile, was preparing for the truncation of its main road to the north and the vital supply line through the Bab al-Salama gate. Contingency plans were heatedly discussed in Gazientep in anticipation of what looked to be an impending siege. Should aid workers rush in as many goods as possible to Aleppo before it was too late, or withhold them at the alternative Bab al-Hawa gate? The pediatric hospital had planned for supplies to last six months, though in reality they would only last three to four months. For the health workers running the only specialized ward for acute malnutrition in Aleppo, the outcome would be clear: If there was no access to besieged areas, people would die from starvation and children would be the most vulnerable. The facility, which was just around the corner from the blighted Dar al-Shifa building, had already relocated three times due to barrel bomb attacks. A five-floor building, it could only operate from the basement and the first floor. Some 60% of the personnel had already left, leaving it with just four pediatricians. 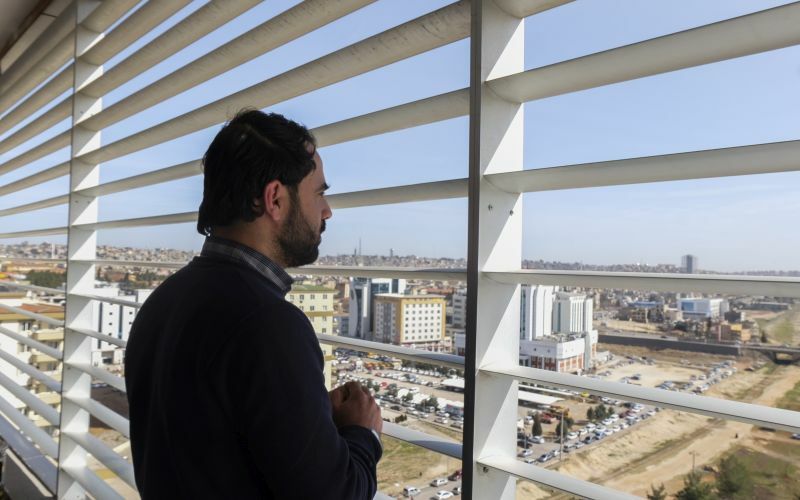 Dr. Hatem, the hospital’s young director, explained how most of his colleagues had left for Turkey, unable to withstand the menacing skies, but that he had decided to remain for now. A few days later, he was shot at on the Castello road while travelling back to Aleppo from Turkey. An unpredictable frontline on the ground was further endangering the last narrow points of access. In February, the world turned its attention to the hospitals of Aleppo province, yet for the doctors on the ground, this escalation was only the latest in a long history of government attacks. “The severity of Russian airstrikes combined with the fact that this war has been going on for a very long time makes the medical response on the ground extremely difficult,” stressed Dr. Mahmoud. Aleppo’s doctors have long been familiar with the failure of U.N. resolutions and ceasefires to safeguard their places of work and the area’s civilians. After the latest cease-fire was announced by truce brokers far from Syria, the health workers went about their site visits looking for malnourished children in Aleppo’s poorest neighborhoods not knowing whether they would come back alive, as they had always done before. “Without a doctor, it’s difficult to create doctors,” said Dr. Safadi. “That’s why despite everything, we are trying to keep our doctors in Aleppo,” he said. Maya Hautefeuille is an independent photojournalist based in Gaziantep, Turkey and supporting the media-based advocacy for the cross-border Syrian NGO Independent Doctors Association responding to the Aleppo crisis.